Review date: 10 July 2001. Everglide started off as a mousemat company. At the time, the idea of having a whole company that sold nothing but mousemats seemed a tad ridiculous. 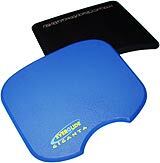 But as it turned out, the hard plastic Everglide mats worked really well, and squillions have been sold. I review some of them here and here. Over the last couple of years, though, Everglide have expanded into various related products - mouse and keyboard accessories, and now also other gadgets that appeal to their particular market segment. That market segment is not, by and large, people whose idea of a good time is using a whimsical font in an Excel spreadsheet. The Everglide mat is durable and slick, which makes it ideally suited to use by the LAN-party gamer - someone who lugs their computer off to a venue where like-minded souls hook up an ad hoc Local Area Network and see, for a few hours, if there truly are any problems in the world that can't be solved by violence, at least of the virtual variety. Now, Everglide have several other LAN-party-relevant products; they're handling sales for Gamerz Stuff. And they sent me a few to play with. 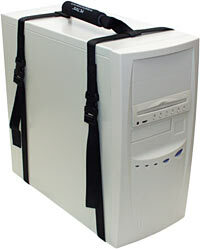 The PC Tote is a carrying harness for your computer. The Pocket Network Cable is a retractable 10/100BaseT cable that can fit in a very small space. The "BattleLamp" is a small light that'll let you see your keyboard in a darkened party venue. And there are a couple of other network accessories, too. This compact package is all you need if you want to add a handle to the top of your PC. With that handle, you can carry the thing easily. Without it, you can't. I hope I'm not going too fast for you here. 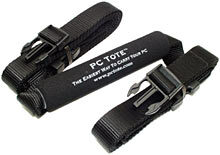 The PC Tote's an easy-to-use two-strap arrangement that wraps around the PC case and clips together. It's not difficult to correctly adjust it for a very firm fit, and the nylon webbing and plastic clips seem strong enough that you needn't worry about your precious cargo hitting the deck unexpectedly. Everglide sell the Standard model of PC Tote for $US14.95. It'll fit cases up to about 137cm (54 inches) in circumference, which means it should be fine on pretty much any midi-tower or smaller case. That includes Lian Li's PC-60 series (reviewed here), by the way; they're a bit fatter than the average, but the PC Tote will fit. If you want a handle on a tower case, you can pay another five US bucks for the "XL" model of PC Tote, which is good for up to a 1278cm (70 inch) circumference. A fully stacked tower case is probably a bit more than you're going to enjoy carrying one-handed. But the typical LAN Partier's Tower PC, which contains no more hardware than could fit in a microATX box but has a really big case for effect, should be OK. The minimum circumference the PC Tote will fit, by the way, is 30cm - 12 inches. So you can probably cinch it around a UPS or similar small but heavy item, as well as around a PC. The manufacturers accept no responsibility for what may happen if you try using the PC Tote on odd things, though. The PC Tote's easy to attach, holds solidly, doesn't have to be removed before you can use the computer, has a comfortable rubber-tube handle, and comes in various colours. And it's cheaper than the alternative. I've previously reviewed the CaseAce Products GearGrip Pro, which is the same sort of thing as the PC Tote, only more so. For $US34.95, it gives you a harness that attaches in the same way as the PC Tote, but you also get a detachable mesh pouch on the side for keyboard, mouse and other extras, and a couple of loops for holding cables. And a not-too-useful shoulder strap. The GearGrip is about the same size as the regular PC Tote, and there's a larger version which is about the same size as the XL PC Tote. The larger GearGrip only costs $US2 more than the small one, though. There's also now a $US26.95 "GearGrip CRT" for carrying monitors up to 21 inch size. If you're not at least an enthusiastic amateur weightlifter, wandering around with a 30 kilogram 21 inch CRT hanging from one hand is not recommended, but smaller screens shouldn't be a problem. If all you need is a basic PC carrier, though, the PC Tote wins. If the GearGrip's extras turn your crank enough to make the extra dollars worthwhile, then buy it instead. But the PC Tote is much cheaper - Everglide are actually selling it for a little less than you'll pay if you buy directly from the PC Tote site. And it does the basic job just as well. I must admit that I, personally, have never cursed the astounding amount of space that an ordinary network cable takes up in a bag. If you have, though, Everglide's $US24.95 Pocket Network Cable could be the product for you. 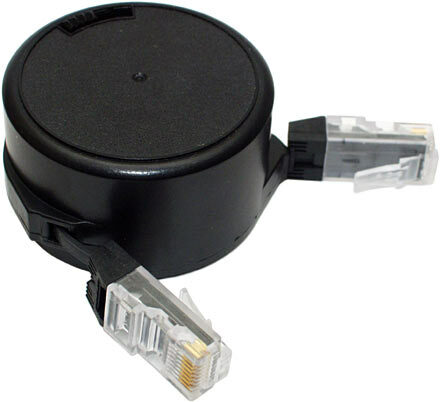 The plastic reel housing in the middle of the cable is only about 50mm wide by 29mm thick (2 by 1.1 inches), so despite the standard RJ45 connectors sticking out of either side, this really is a pocket-sized product. Fully extended, the cable's about 2.9 metres (9.5 feet) long. The behaviour of the cable's controlled by this little slide switch. With the switch in this position, the cable reel's got an inertia-ratchet design and behaves pretty much like a pull-down roller window shade. It goes click-click-click as you extend the cable, then latches whenever you stop. A quick jerk on the cable causes it to retract again. With the switch in the other position, the ratchet's disengaged and the cable retracts whether you jerk it or not. To extend the cable, you're supposed to plug one end into some well-anchored device, take hold of the other connector, and walk away - without holding the reel. This may not be practical if you're plugging the cable in between, say, a laptop and a little hub, both of which will just be yanked off the table by cable tension. But you can extend the cable just as well by hand-pulling both ends out, again without holding the reel. The instructions sternly warn you not to hold the reel and pull just one end of the cable. 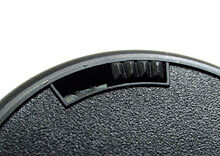 If you do, the two-way reel mechanism will get unbalanced, resulting in a cable that never quite retracts right again. Used according to the instructions, the Pocket Network Cable behaves itself well. I don't know how long the unusual super-flat cable the thing uses will last, but I presume the manufacturers are not complete turkeys, and it'll actually hang in there for a long time. Likewise, for all I know the retract mechanism may go sproing after a few dozen cycles. But it seemed OK to me. Solid though it seems, though, $US24.95 is rather a lot to pay for a network cable. You can get ordinary cables around this length - two or three metres - for not a lot of money at all. A three metre cable, delivered, is $AU8.80 from Aus PC Market (which Australian buyers can visit, to place an order, by clicking here), and not a great deal more even from the electronics stores that may sell LEDs and resistors cheap, but gouge their customers for wire. $AU8.80 is something like $US4.50. The Pocket Network Cable's pocketability has made it more than five times as expensive. The Pocket Network Cable is actually an iGo Corporation "Road Warrior" brand ConnectCord NET, but you won't get it any cheaper if you buy direct from iGo. Looking around the Net, I found various dealers selling the ConnectCord NET for a buck or two less, and some other places with it for less than $US20, but with no stock. So this is pretty much what the thing costs, folks; Everglide aren't ripping you off. It's up to you whether you think the convenience outweighs the price. The "BattleLamp" is a little variable-brightness 12 volt light on a flexible gooseneck, with two possible base designs - a weighty flat plinth, or the clip-on model I got for review. Both models cost $US29.95. This is a product that'll probably look familiar to anybody who's worked a mixing desk or lighting console, because little lights just like this one are commonly seen in those environments. They're bright enough to read cues and find controls, but not bright enough to bother anybody not sitting right by the light. And they can be turned down very dim if necessary. 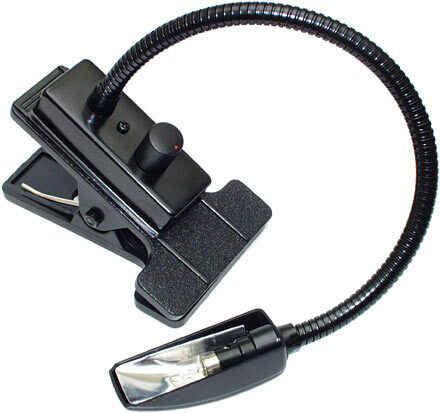 These lights can be had with various other bases on the gooseneck - you can get ones that screw onto BNC or XLR microphone fittings, and ones that are connected to a 19 inch rack faceplate, for instance. The neck-and-light assembly seems to be very much the same in all of them, and the combination dimmer knob and on/off switch is also a common feature. The business end of the BattleLamp has a four watt bayonet fitting 12 volt bulb, which ought to have a respectable amount of life, and can be cheaply replaced when it dies. The reflector's held in place with a friction fit over a couple of O-rings. It won't fall off by accident, but it can easily be removed to swap the bulb, or if you just want to (dimly) light the whole room. The gooseneck is very flexible and stays where it's put; it's easy to angle the light as you like. 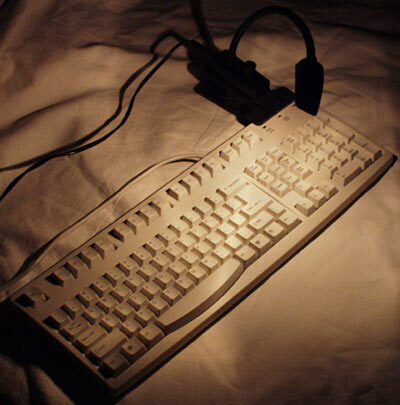 The BattleLamp's powered by a plugpack, and has a standard DC barrel connector. The plugpack you get is a 110/120V unit, which is of no use to people in countries using 220/240V mains. Like Australia, where I am. In this situation, you can run the stock plugpack from a step-down transformer if you've got one, or you can just pick up a half-amp-or-better 12V plugpack with the right plug. I had one such already in my Big Bag O' Wall Warts. 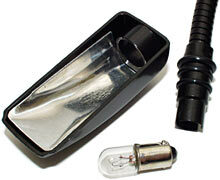 Since this is just a light, the polarity of the barrel plug doesn't matter. The clip-on BattleLamp can be attached to things up to about an inch and a half thick, and the base has V-shaped rubber inlays that let it clamp effectively onto tubing as well. 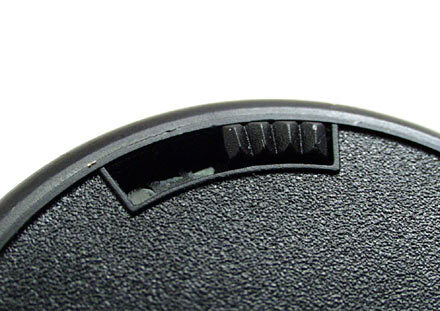 There's also a half-inch hole in the bottom of the clip that'd let you bolt the base to something. You ought, therefore, to be able to find somewhere to install the clip-on BattleLamp version in just about any computing situation. Clipping it onto a desk or trestle table at a LAN party will be easy. A four watt non-halogen 12V globe, though, is not exactly a lighting powerhouse. If you want enough light to be able to easily read by it, you're not going to get it over an area bigger than about an A4 page. That's fine when you just need to be able to see your keyboard, though. EverGlide are selling this thing as an accessory for people who want a bit of light on their single, ah, workstation, in a dimly-lit LAN party environment, and it's OK for that purpose. Sitting in the dark and staring at a bright screen is a great way to get eyestrain, of course. But at least the BattleLamp lets you tell your "talk" key from your "set on fire" one. Is this thing worth the money? Well, it's basically either an overgrown "book light" or an underdeveloped desk lamp, depending on which way you look at it. There are quite a few products in these categories; the Asian-made ones are likely to be cheaper than the BattleLamp, while the nicer European and US-made ones are likely to be more expensive. The lowest power globe you can put in a desk lamp is likely to be around the 15 watt mark, and will be brighter than you want. Conversely, tiny book lights that run from a battery pack may be too dim. If you can find a small dimmable adjustable lamp with the same sort of base, then it'll be as good as the BattleLamp. And it's not exactly rocket science for anybody with a passing acquaintance with electronics to knock up an incandescent or LED light suitable for making a keyboard visible. But if you want to get a nice solid adjustable solution without any fooling around, the BattleLamp fits the bill. These gizmoes are part of the PC2PC Network Kit on the Gamerz Stuff site. You're looking at a couple of three foot RJ45 crossover leads, and an RJ45 joiner. These are standard items that you should be able to get at any decent computer store, but they're nonetheless useful. The full PC2PC Kit gives you one one foot crossover cable, one three foot one, one joiner and one Pocket Network Cable. With a crossover cable, you can directly connect any two 10BaseT or 100BaseT network devices. Connect together two computers and they've got their own little two-station LAN, with no hub required. Connect together two hubs or switches and you "cascade" them, making one bigger LAN out of everything else that's connected to the cascaded devices. To cascade hubs or switches, you just use a crossover cable to connect any two normal ports. Many hubs and switches already have an "uplink" port, usually shared with some other port so that you can't use both at once. 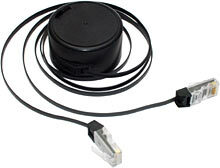 The uplink port is a pre-crossed-over port, which lets you use an ordinary non-crossover network cable to connect to a normal port on another hub or switch. If you've got an uplink port, you don't need a crossover cable. 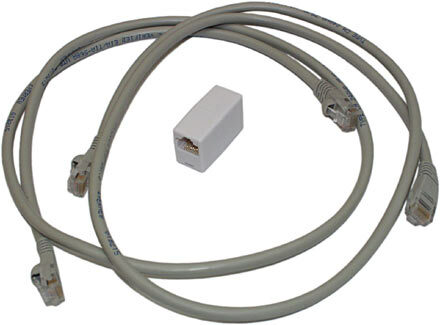 The RJ45 joiner lets you, well, join network cables together. Connect two normal cables and you get one longer cable. Connect a crossover cable to a normal cable and you get a longer crossover cable. Connect two crossover cables and you get one longer normal cable. Pretty straightforward, eh? With a short crossover cable - of which you get two in the PC2PC Kit - and a joiner, you can quickly turn any network cable into a crossover cable, without adding miles of length to the thing. Everglide's page on the subject has their pricing for this gear. The coupler by itself is $US3.45, the three foot cables are going for $US4.25, and there are various combinations. One three foot cable and one coupler is $US7.45, for instance. The cables are well made and have rubber boots on the connectors (so they won't snag on other cables and snap off...), and the joiner's completely unremarkable, but looks good enough. Web hosting kindly provided by SecureWebs.